Since leaving New York, I have noticed that my secret shopping craving has all but disappeared. I am not confronted each day on the subway and Manhattan streets by cute handbags parading by, expensive shoes, fancy iPhones and the like. (I mean, I barely even get cell service here, what’s the point?) Generally, I find that I just don’t think so much about what I wish I had. Until my seed catalogs arrived. The gray days of January, wet and chilly with bare tree limbs as far as the eye can see, put a real damper on my commitment to optimism. 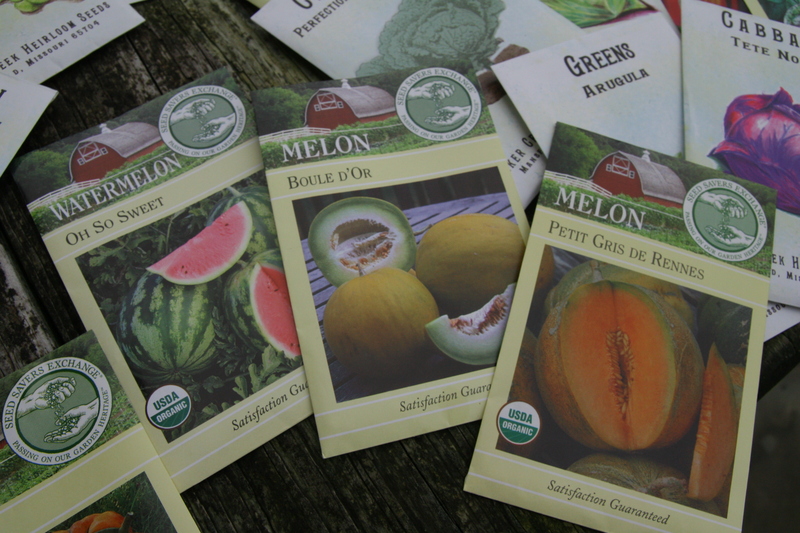 Then I flip open the seed catalog to the melon section where bright green, orange and pink fruits practically drip off the page. I can just taste the honeydew! Or jump over to the tomatoes…all 10 pages of them, red, yellow, beefsteak, cherry, deliciousness. Then there are the peppers — sweet, hot, crunchy….It’s like instant sunshine. I WANT THEM ALL. This week we ordered our 2012 garden seeds, and they arrived in the mail today! Our aim is to feed ourselves as much as possible from our own soil. The wheat we planted back in October is showing spikey green shoots, and we’ve got some onions, leeks and garlic in the ground hibernating until spring. Now with our new arrivals, we are setting ourselves up for a year of veggies, fruit and even some flowers to keep things cheery and attract bumblebees. I could provide you with a glimpse of our garden spreadsheet, but I shall spare you the boredom. 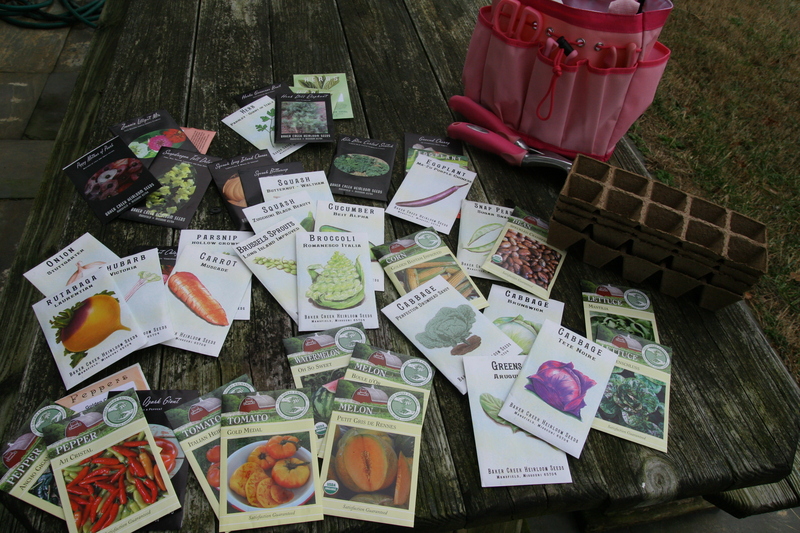 Instead, take a look at these beautiful seed packets from Baker Creek Heirloom Seeds and Seed Savers Exchange. We’ve been reading The Heirloom Life Gardener (published by Hyperion) which I highly recommend if you are interested in seed saving, gorgeous pictures, or an introduction to unique vegetables and varieties. For instance: ground cherries, Malaysian eggplant, orangeglo watermelon. Talk about juicy pictures dripping off the page! The book is by Jere & Emilee Gettle, founders of Baker Creek Seeds, and an old-timey Ozark village (not kidding, check it out). We also ordered some flower seeds — mainly varieties I fell in love with a few years ago when we bought bunches of blooms at the NYC Greenmarket for our wedding. I can’t wait to have bright and beautiful snapdragons, rununculus, scabiosa, oriental poppies and zinnias in the house (and garden) all summer long. So, my revived shopping itch has been scratched. How much of a splurge was it? We laid out $111 for all these seeds, which I think is not so bad (full disclosure, there are a few we still need to purchase…like strawberries!). And, technically it shouldn’t count as shopping anyway because we’re going to eat pounds and pounds of this produce all year long. “Endless hours spent baking bread, studying chicken coop plans, gathering eggs, browsing seed catalogs, weeding the vegetable garden, attending sheepdog trials, dreaming about heritage-breed livestock and longing incessantly for a farm of one’s own”. As I read this I was thinking check, check, check….are there chickens in your future?